Bi-Office Table Top Self-Stick Flipchart Pad 585x500mm 20 Sheets White FL148303 – BQ55484 – OfficeYoo! Peel off each page and affix it to a wall to write up meeting notes or brainstorming ideas. 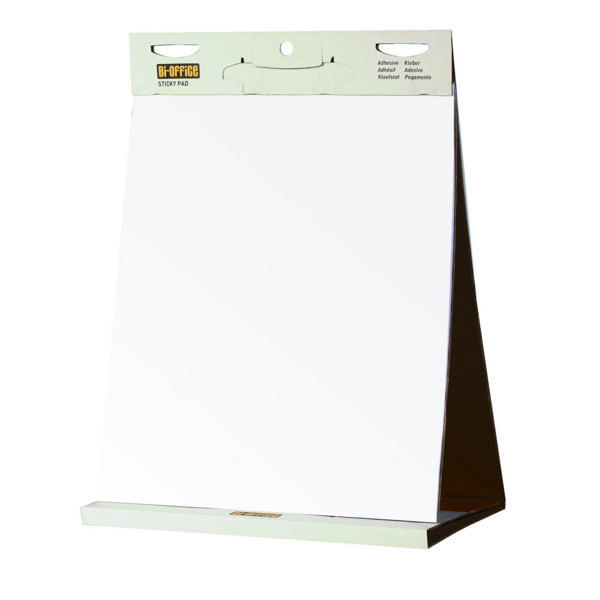 Or hold the pad into a sturdy triangular shape to use as its own desktop easel – it even comes with a carrying handle. The solvent-free adhesive sticks firmly in place but can be easily removed without leaving any spots, marks or residue behind.